If you haven’t tried cauliflower as a potato alternative, it’s time. This holiday season, consider a nutritious twist to the time-tested potato dish: Cauliflower Mash. Really. If you make this Cauliflower mash and top it off with Mushroom Gravy, you’ll have yourself a new tradition! Cauliflower contains about 28 calories and 5 carbohydrates per serving compared to over 100 calories and 20 carbs in potatoes. Plus, you get to sneak another serving of veggies into your meal. What could be more beneficial? Macadamia nuts can be on the expensive side, but trust me—the creamy nuttiness of macadamias bring this dish from good to WOW and are so worth the splurge. If your wallet is hurting too much from all that holiday gift shopping, feel free to sub in cashews or pine nuts for up to one third of the nuts in the recipe. You’ll want to be sure to taste and adjust the finished dish to bring out your favorite mashed potato flavor. Prepare by having a little extra garlic, salt and pepper on hand in case you need to do your own tweaking. Be advised that these “potatoes” do not keep well. They are fabulous when made fresh, but are not nearly as tasty as leftovers. Just like Grandma always insisted, you’ll have to finish them off before you leave the table! Put macadamia nuts into a food processor with the S blade. Pulse briefly to slightly break up the nuts. Add the rest of the ingredients and process until the mixture looks and fluffs like mashed potatoes. 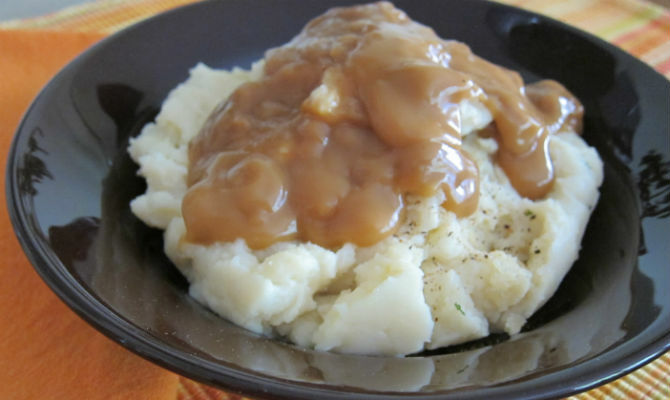 Blend gravy ingredients until creamy and smooth, adding water as needed.